Robert D. Parmet is Professor of History at York College of the City University of New York specializing in labor history. The Steelworkers’ Organizing Committee (SWOC) of the Committee for Industrial Organization (CIO; Congress of Industrial Organizations in 1938), had entered into a collective bargaining agreement with U. S. Steel (“Big Steel”), and in 1937 sought a similar accord with smaller companies, Republic Steel, Youngstown Sheet and Tube, Inland Steel, and Bethlehem Steel (a group known as “Little Steel”). Unable to gain union recognition by these firms, 81,500 steelworkers in twenty-nine plants went on strike, and were defeated. In a well-written and highly detailed study, Ahmed White, Professor of Law at the University of Colorado, Boulder, discusses this strike and its devastating consequences, which extended well beyond the steelworkers and impacted the American labor movement in general. When SWOC struck the four “Little Steel” companies in 1937 it was exercising its rights under the Wagner Act of 1935, which supposedly guaranteed their right to organize and bargain collectively. However, the workers lost not only the strike, but also sixteen of their number, including ten who were killed by armed police in South Chicago on May 30 in the “Memorial Day Massacre.” According to White, this walkout constituted “the deadliest strike” since the 1920s. Union recognition would not be achieved until 1942, five years later. As promising as it was in 1935, the Wagner Act did not provide adequate protection two years later. White shines an overdue spotlight on one surprising source of this weakness, President Franklin D. Roosevelt. Though the law created a new National Labor Relations Board as its enforcement arm, the Roosevelt Administration gave it only lukewarm support, beginning in mid-1937, when it began to follow a “rightward trajectory of social policy.” Accordingly, business leaders were “encouraged . . . to redouble their resistance to reform.” Moreover, the CIO increased its dependence on “political favors and legal process” as the New Deal accommodated itself to “unbroken corporate power.” This Administration shift, in addition to considerable violence and other devices, “destroyed the drive in steel” and damaged the CIO. Though White’s primary focus is on the Little Steel Strike, he also provides fascinating background information on the steel industry. For example, he describes the process by which the iron industry made the transition to steel production in the nineteenth century. It was a move that was accompanied by a decline in unionization as a different level of worker skill was now required. Steel was less expensive than iron to produce, and as iron production increased so did plant size and the gap between management and labor. A result was “unprecedented controls over both machinery and workers.” “In the end, steel made men, just as men made steel.” Beginning with the Homestead Lockout of 1892, as White describes, the director of Carnegie Steel, Henry Clay Frick moved to impose “open shop” labor relations without unions. “Extending the open shop in steel was part of the reason U.S. Steel was created in the first place” in 1901. That company dominated the industry, and the open shop was its lifeblood, with a “culture of open-shop violence and intimidation.” The Employee Representation Plan (ERP), or company union, became the form of labor organization approved by management. The Little Steel Strike is perhaps most remembered for its violent defeat of unionism. However, as White points out, its legacy also included legislative changes. 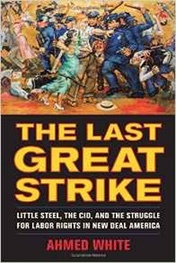 At the strike’s conclusion, Little Steel combined with the National Association of Manufacturers “to draft amendments to the labor law and press for their adoption.” Resentful of the CIO, conservative members of the rival American Federation of Labor joined this effort, which Representative Howard K. Smith of Virginia led in Congress. Smith sponsored legislation that failed in 1940. White might have added that three years later, following strikes by the United Mine Workers of America (UMWA), Congress passed the anti-labor Smith-Connally Act. The culmination of counterattack, he discusses in detail, occurred in 1947, with the passage of the even more hostile Taft-Hartley Act. Both laws curtailed the right to strike. Taft-Hartley also deprived the NLRB of its function as a mediator, thereby preventing its involvement in labor disputes and reducing its ability to influence labor policy. Similar to the U.S. Supreme Court, in recent years the agency has become an instrument of party politics when board vacancies have occurred. In the 1930s American workers believed that Franklin D. Roosevelt and his New Deal were on their side and they could join unions to better their lives. Acting according to this belief, they flocked to unions, and by 1955 more than of a third of the labor force was organized. However, since then the number has steadily declined to where the level of union affiliation has fallen to less than ten percent. The reasons usually given for this decline include political hostility, technological change, and globalization. Another now heard is the collective bargaining right of the 1930s. When unions negotiate from positions of weakness, their gains are often offset by “givebacks.” Moreover, the unfavorable contracts that result legally bind workers for long periods of time to poor conditions, a situation the authors of the Wagner Act obviously did not envision. It is to White’s great credit that he compels a reevaluation of the law and its impact, with the reality being that from its inception its enemies refused to accept it. Their counterattack began in 1937, and shows no signs of ending.